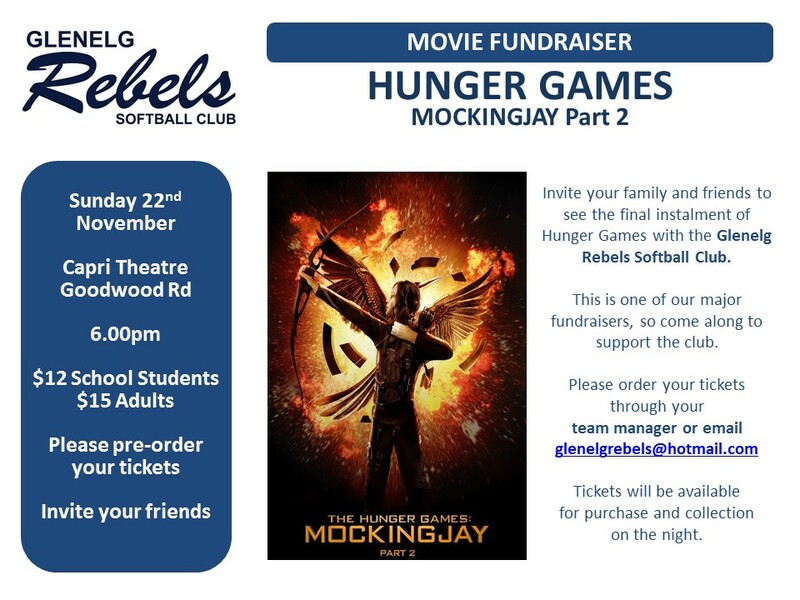 Rebels invite your family and friends to come along with you to see the final instalment of the Hunger Games series. Tickets: Adults $15 / Students $12 ... please pre-order your tickets at glenelgrebels@hotmail.com or through your Team Manager. Tickets will also be available for purchase and collection on the night. This is one of our major fundraisers so please come along and support the Club. We will also have a raffle with the prize drawn on the night. Please click here for Merchandise order form / price list ... cut off date for orders is Monday 23rd November. Prompt payment would be appreciated as we are not able to hold orders over the Christmas break. The balance of your playing fees must be paid by this date, unless you have already established and are adhering to a payment plan. Players who's fees are not paid in full by this date will not be able to take the diamond until the balance is paid.